This project, to begin our study of Africa, we were each assigned a different African nation to study and learn about, and then we synthesized our learning into an infographic art piece. Many people finished their projects digitally, but I chose to do mine by hand. The final project was fined with black ink pens and colored pencils. "Country Profile: Senegal." Africa: The Good News. South Africa: The Good News, Oct. 2011. Web. 7 Dec. 2012. <http://www.africagoodnews.com/>. National Geographic. Atlas of the World, Eighth Edition. Washington, D.C.: National Geographic, 2005. Print. 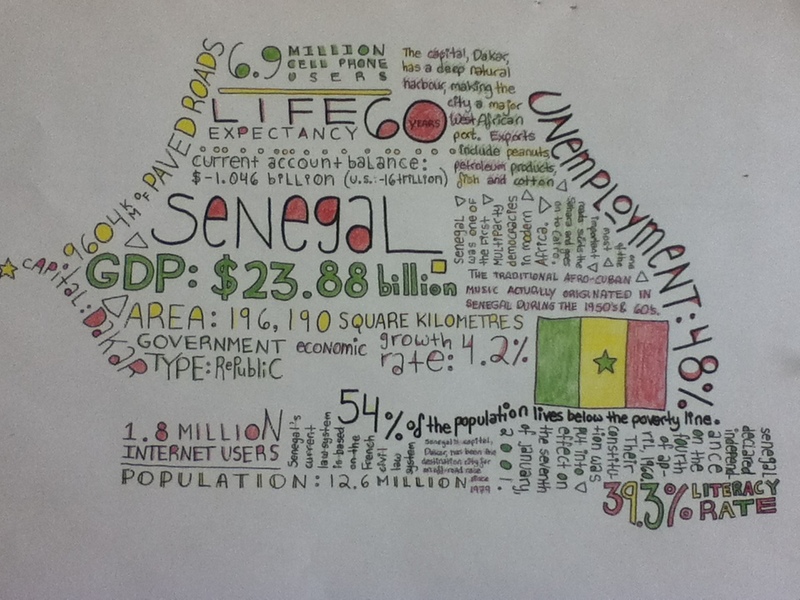 "Senegal Facts." National Geographic. National Geographic, 2005. Web. 07 Dec. 2012.